Solid or Engineered Hardwood Oak Flooring – How Do I Choose? One of the more common questions we get asked here at Blueprint Joinery is whether a customer should buy solid or engineered hardwood oak flooring. Aesthetically speaking, you’d probably find it difficult to distinguish between either product once installed, but from a manufacturing point of view, they are made very differently. We believe that depending obviously on where and how you want the flooring to be fitted, both options have their pros and cons. This article will take a look at the difference between solid hardwood oak flooring and engineered hardwood oak flooring, and where both products are best suited within your home. For more specific information or help regarding our oak floor products, please don’t hesitate to get in touch with a member of our expert sales team on 01691 671020 for further assistance. What is solid hardwood oak flooring? 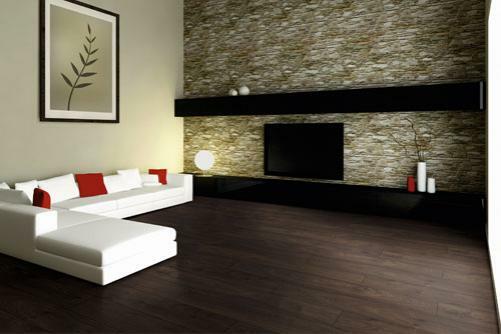 Solid hardwood flooring is manufactured from one single solid piece of wood. The wood is cut straight from the tree trunk and then sawn into individual planks by a machine. Whatever the timber type or grade of wood you are interested in buying, it is very likely you’ll be able to purchase a solid hardwood floor variant. All the solid hardwood oak flooring that we stock come with a tongue and groove fitting profile which make it easier to fit. The great advantage of solid hardwood flooring is that it can be sanded down and re-finished many times making it a great investment in areas with high or regular foot traffic. The downfall to solid hardwood flooring is that the planks can become damaged by moisture, a hot room could make them dry out and shrink, and a cold room could cause them to absorb moisture and expand. For this reason, it is not recommended to use this type of flooring in bathrooms, kitchens, conservatories or rooms with underfloor heating. Rustic Grade UV Lacquered Oak Flooring. Check it out here. There is a slight misconception with some of our customers that engineered hardwood flooring is the same as laminate flooring; it is not. Unlike solid hardwood oak flooring, engineered hardwood oak flooring is made up of multiple layers. The top and the bottom layer is 100% natural wood, and the middle is typically built from 5-8 layers of plywood that crisscross in different directions. Engineered flooring is less likely to expand and contract when exposed to moisture and humidity making it a great option in rooms that are subject to moisture (kitchen and bathroom) and heat (conservatories or rooms with underfloor heating). The downfall of this type of flooring is that the process of sanding and re-finishing can’t be carried out as many times as with solid hardwood flooring, so not recommended generally in areas where there is high foot traffic. Grey Mist Engineered Oak Flooring. Check it out here. So what flooring is best? The first thing we always ask an enquiring customer is where they plan to install their new flooring. Solid hardwood flooring is especially suited in areas where there is high foot traffic as it can be sanded down and re-finished several times without affecting its looks and functionality. This makes this particular flooring great in hallways and living rooms. In rooms subject to fluctuating heat and moisture levels such as conservatories, kitchens, bathrooms, and rooms with underfloor heating, we would recommend engineered hardwood flooring instead. The way engineered hardwood flooring is manufactured allows it to withstand more varied changes in surroundings meaning its less likely to expand and contract. It is really important to consider and measure the moisture level in your subfloor. The subfloor is the layer that goes between the decorative flooring (wood, carpet, tile etc) and the structural components (joists or foundations) of your home. We recommend a reading of 2-3% max moisture content and 35%-40% humidity before laying a solid hardwood floor. If the percentages that you are obtaining are higher than 2-3%, engineered hardwood flooring would be better suited. Tip: Always check with the manufacturer first to see a floors max moisture level as this will vary. As touched on already in this article, if there is a high footfall in the area that you plan to floor, solid hardwood flooring is recommended as the more practical solution just because it can be sanded and refinished several times. Unlike solid hardwood oak flooring, engineered hardwood oak flooring might only allow sanding and re-finishing 3-4 times comfortably during its lifetime. Solid hardwood flooring is typically more expensive than engineered hardwood flooring because of the amount of solid wood used in each plank. If you can afford solid hardwood and it ticks all the boxes above, it might be a worthy upfront investment that could last you your lifetime. If on the other hand, you’re on a tight budget, then we would always recommend engineered hardwood flooring instead as the upfront cost in comparison to solid hardwood flooring would typically be a lot lower in price. We hope that you found this article helpful, but if you’d like more specific advice for your floor project, don’t hesitate to get in touch with a member of our expert sales team who will be able to assist you further. All our contact details can be found on this page, or if you live near to/passing by Oswestry, why not pop by our workshop at Unit 10, Radfords Field Industrial Estate, Maesbury Road, SY10 8RA where you can talk to us in person. Please check out our Flooring section and brochure today.